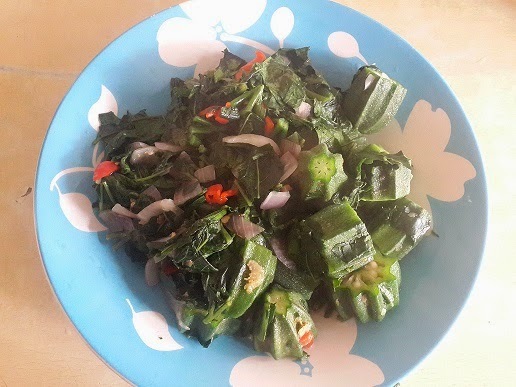 My Ugu and Okra recipe._Less than 100 calories. Sorry for being absent, been a bit occupied but i'm here now. So how are you doing? Oya o, June challenge people, where una dey?? I want to briefly share my ugu and okro recipe with you. I think i've done so in the past, but i have modified it to have less calories. Its very filling and highly nutritious. Salt and seasoning cube to taste. Method: The way you make this dish, matters a lot. I will not say much. Add a cooking spoon of water to your pot, toss in the okro and onions and pepper. Add a bit of salt. Please go easy on the salt. 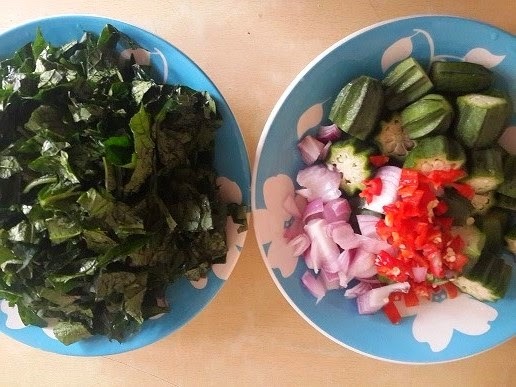 Immediately it starts simmering, stir the okro and add the ugu leaves. Stir again and add your seasoning cube and crayfish. Stir one last time and turn of the heat immediately. I didn't add oil to this because it not necessary, you can if you want. Don't add more than a tbsp though. This meal as it is, can serve 2 people and is less than 100 calories. You know we want to keep the cals low yet get lots of nutrients. I had this for breakfast today, with 1 boiled egg and a cup of coffee as usual. Hahaha! You can make yours with fish, chicken or beef. You can equally have it with some brown rice. Try it this weekend and let me know how it goes. God bless. We dey here ooooo. Wow! it looks Yummy.... Nice one Cheliz. Well am still trying to get used to cooking without Groundnut oil or palm oil, so far I am now using 1 or 2 table spoons. Have a nice weekend. Miss B dearie. How was ur day? I just wanted to go easy om oil today av had too much for 1 week. With time u'll appreciate food more, with or without oil. Keep it up darling. Have a nive weekend too. Yes o. By the time am thru with the plate I wont miss the fact that theres no meat there, thats why I cut them in chunks. Lol. Looks yummy cheliz but, would dice my okro in small sizes. Thanks for the recipe. You're far too nice. Fina. Thats fine too Fine. Make sure u dont cook for long pls. Big hugs for u sweet. Haaa Fifi no vex abeg. Wont try it again. Lol. I de oo. Hanging on and thanking God for each day that I get to exercise and eat well. Exercise is not my friend, but I'm still pushing myself. I've being doing firm and burn pilates with 5 lbs, but hoping to switch things up next week. Doing okay with food, though I could be better, fried ripe plantain has been my downfall. But no bread or rice, despite all the temptation in my house, so I won't beat myself up. I didn't do the squats challenge, but I'll challenge myself next week to do it for at least three days. Thanks for the continued motivation and tips. Lol. Oh Kate. I wont even say "I told you so" anyways thank God you know now. My dear 1kg in a week is huge, its commendable, u did great. Pple r different, we lose weight at different rates but, 1kg loss in a week is perfect. Take care dear and thanks a bunch. Cheliz biko, am toothpick wit enough tommy, advice me on wat to do and eat as well for ma tommy, hw will d fat circulate to d whole body and leave d tommy alone pls?? Hahaha Zcyndy, av been trying to imagine a toothpick with enough tummy...lol! Come lemme give u meal plan to help blast the tummy. Its probaby caused by excess carbs and sugar. It is well. Call me pls. Take care. Hi dear. Cheat day doesnt mean u get to eat sin foods all thru d day, you are only sabotaging all ur efforts. You are only allowed to just treat urself to stuff like half a bar of chocolate or 1 meal uve been longing for all thru the week. Still u need to have 'moderation' in mind. U can gave the coke if u really want it, its ur call dear. Tnks a mil. I didn't hv it and I didn't really know what cheat is. I read about it. It contains a harmful substance called aspartame. Tnks. Wud hv my green tea for dinner. Cheliz where r u o! It's monday morning....pls dnt leave us hanging oh! My dear Efe, I'm so sorry dear. I have posted something for you. God bless. A friend forwarded ur blog to me. I am inspired. I weigh 99kgs, but i started an all fruits diet on 16/06/14 and will do it for a week. I'll keep u posted with what i achieve on Monday. Keep up the good work.